I wonder how many beets I’ve eaten in my lifetime? As a toddler, my mom gave me roasted and smashed up beets for “dessert.” With no hesitation, she actually called beets “dessert.” So did I until I was set straight by Penny Bell at my first sleep-over. You can imagine my surprise when I found out other kids got Twinkies and Ding Dongs for dessert while I was eating some version of root vegetable paté. Such is life. We learn early on, that in one way or another, all families are weird, quirky, different, and wonderful. My mom was a mixture of Elizabeth Taylor (glamorous), Julia Child (a gourmet cook), Amelia Earhart (adventurous), and Lucille Ball (off-the-wall funny). “Beets for dessert” was just part of her unconventional culinary repertoire. In all this time, it’s never dawned on me to pickle beets. In fact, I’ve never pickled anything. It was easy. I made a batch of pickled beets and ate them for four days straight. I have a new addition to my beet arsenal. 1. Place scrubbed and trimmed whole beets in a large saucepan or soup pot. Add enough cold water to cover with about 3 inches extra. Bring to a light boil, turn heat down and simmer for about 40 minutes, or until tender when pierced with a fork. Drain and let beets cool. When cool enough to handle, slip the skins off and slice in thick rounds. 2. Place apple cider vinegar, water, and sugar in a saucepan. Bring to a low boil, reduce heat, and slowly simmer for about 10 minutes. Stir often to dissolve sugar. 3. Place sliced beets in a shallow glass dish. Pour liquid over the beets, making sure all are covered. Refrigerate for at least an hour. Drain and store pickled beets in a glass container in the refrigerator for up to a week. 4. To make dressing, first place mustard in a glass jar. If you start with the mustard, it won’t separate. Add apple cider vinegar, honey, olive oil, and freshly ground black pepper (to taste). Replace the lid and shake like crazy. 5. 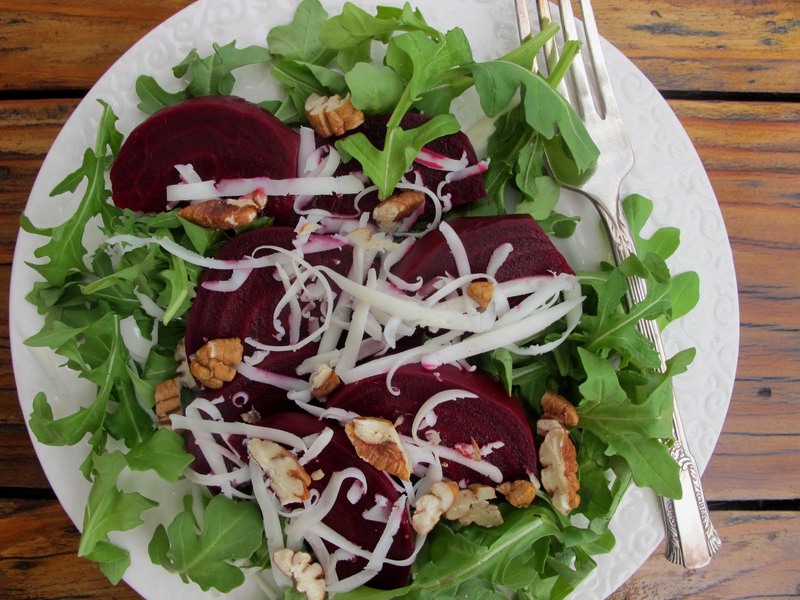 Place arugula on salad plates, arrange beets on the greens, sprinkle chopped pecans and grated Parmesan over the salad. Drizzle with dressing and serve. Peace, joy and beet love! This entry was posted on Thursday, April 11th, 2013 at 5:10 am	and is filed under Gluten-Free Recipes, Super Foods. You can follow any responses to this entry through the RSS 2.0 feed. You can leave a response, or trackback from your own site. Oh my goodness, Melissa, I laughed out loud when I read that first paragraph! What a surprise indeed! But what a gift your mom gave you, by teaching you the value of real food and that sugar wasn’t necessary. I’m still not on the beet train (i.e., “regular,” much less pickled beets), but I love arugula and the rest of the ingredients sound amazing. You might push me over the experimentation edge. p.s. I just decided to see if there is a National Beet Day. When I put that phrase in Google, Google automatically changes it to National Beer Day, which is turns out was this past Sunday. Why isn’t there a National Beet Day? I love this. I’ve only ever tried to pickle beets once, and that was a natural fermentation method, so we’re talking weeks. Sometimes, a quick pickle is much preferred! Thanks for sharing my beet recipes! I wish I had heard your story when I was raising my son! I totally relate to your Mom, as my husband and son would agree, sometimes with chagrin. Beets for dessert would have fit right in, and it would be so pretty, with coconut! Beets for dessert! No wonder you’re such a good eater I am trying this recipe, and the pickled beets. I can still get beets from my Farmer! My Grandpa will smile proudly from heaven. He loved his pickled beets! I loved your description of your dear Mother, what a recipe for a great woman, who can beat (or should that be beet?!) that. p.s. hope life is treating you well Melissa, I’ve missed popping into the GFFG HQ so now I must put that right. My mom always made pickled beets after Easter, and added hardboiled eggs and thin slices of red onion. In late April we attended “Picnic Day” at the UCDavis – an annual open house, and always had pickled purple eggs and beets at our picnic. This looks so lovely Melissa! Quick question on beets – they often give me a pretty bad stomachache, even small amounts. Do you know of a reason that could cause this? It is a feeling that I get only with beets – at least as far as the other veggies I’ve eaten to date. Considering that the Beet Ice Cream recipe is what led me to your blog, i say the more beets the better! ok, forgive me, I am tired from “the week that was” but I knew if I took a stroll through my fav GF sites I’d cheer up fast. How can you not be cheery when you see this salad? and so, I shall make this very soon. And I always enjoy your stories about your lovely Mom.